URBANA — The effort to use local currency to promote local business continues to grow, with more than 60 Champaign-Urbana merchants agreeing to accept UC Smiles. That's up from the 40 merchants who agreed to use the currency when it was unveiled in October. Promoters of UC Smiles — which are equal to a dollar and come in denominations of $1, $5 and $20 — say more than $12,000 worth of UC Smiles are in circulation. That's up from the $5,000 worth of UC Smiles circulating after the currency hit the streets Nov. 1. More than $97,000 of the colorful bills featuring local wildlife and historical scenes have been printed. UC Smiles Executive Director Seonmi Kim said recently that the program will be a success "if we can circulate around 60,000 UC Smiles in a year." The UC Smiles program was started to encourage shoppers to buy local. Many of the early businesses to participate were Urbana businesses, but Champaign retailers and restaurants have also joined. A list of participating businesses can be found at the http://www.ucsmiles.org website. 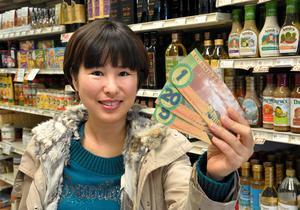 Three businesses serve as UC Smiles exchanges, where dollars can be traded for the local currency. Those businesses are Strawberry Fields and International Galleries, both in Urbana, and Cheese and Crackers in Champaign, Kim said. "We want to have two more — one in downtown Champaign and one in west Champaign," Kim said. "About five (exchange) stores will be enough." Kim, a doctoral student in social work at the University of Illinois, said she thought it would take time for people to understand the concept of a local currency and actually use it. She said she was surprised how many people understood it and attributed the acceptance rate to Champaign-Urbana having "more progressive people who understand community development." Kim said many participating retailers offer discounts to customers who pay with UC Smiles. But she said using local currency has other benefits, including building relationships between customers and merchants and developing customer loyalty. Soon after the introduction of UC Smiles, Kim said, she got feedback from consumers who wondered whether it was illegal to use local currencies and whether local currencies had succeeded in other communities. She assured them local currencies aren't illegal and referred them to sources where they could learn about other currencies such as the BerkShares used in the Berkshires region of Massachusetts. During the early days of planning UC Smiles, organizers wanted to get a 3 percent commission from participating businesses, Kim said. They figured the commission would help cover operational costs. Plus, they reasoned business owners would benefit from UC Smiles publicity and avoid the expense associated with credit-card purchases. But the idea didn't fly, and organizers dropped plans for the fee. For now, Kim said, operational costs are being covered by two grants. But for the long term, organizers are investigating other revenue sources, including online fundraising, federal dollars for community development and identifying potential donors. Kim said there aren't many expenses because UC Smiles is largely a volunteer project. But the program must pay for website management and the printing of brochures, among other things. Two departments at the University of Illinois are planning a survey in March and April to determine how business owners use UC Smiles and how the money recirculates, Kim said. She hopes to have survey results by the end of April. Kim said when the currency was originally proposed, she hoped to have drawings of local community activists — among them, John Lee Johnson and Vashti McCollum — on the bills. But organizers eventually settled on local wildlife and historical scenes. The one-Smile bill features a darter on the front and an 1883 photo of the Old Settlers Society on the back. The five-Smile bill features a kestrel and an 1891 picture of the Champaign-Urbana street railway, and the 20-Smile bill depicts a morel mushroom and the Alma Mater sculpture.